For those of you hammentashen lovers who are tradition bound to those little cookie like triangles of sweetness. I call it functional fixedness. We think we have to have cookie-ish dough (ok yeast ones can be included too) but it’s all about the cutting out the circles, putting the poppy seed, prune, apricot or gasp, cherry or chocolate filling in the middle, pushing up the sides and baking them. Ho hum, same old same old. Well, no more. I’m about to rock your world. You will either love my left turn at tradition and head straight to awesome or shake your head and say, she’s mashugania. 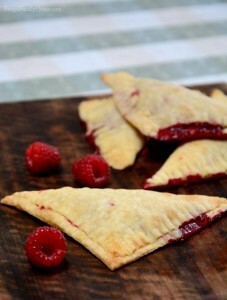 I’m going to suggest that we make hammentashen more like a hand pie. For those unfamiliar with the concept of the hand pie think more of a pie crust dough than cookie dough and any kind of filling your taste buds desire. You just need to use your favorite pie crust recipe (I’ll give you one just in case you don’t have one) and a bunch of filling recipes that will have you making double batches just to keep up with the demand. 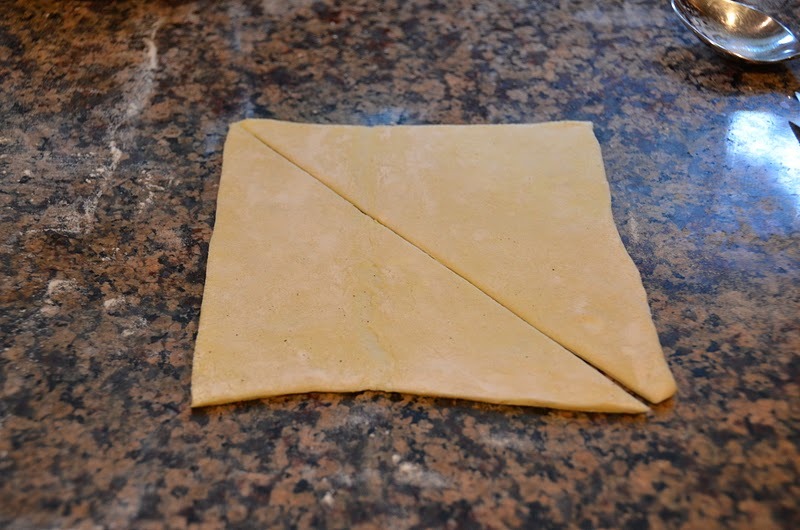 The trick is to roll the pie crust recipe into one big rectangle and then cut it into 3 or 4 long strips (depending on the size of hammentashen you want). Cut each strip into 5 or 6 squares and then cut the square on a diagonal so each square becomes 2 triangles. Here’s your hammentashen. Place the filling in the middle of one triangle, wet the edge with a little water, place the 2nd triangle on top and crimp the edges with a fork. Poke a hole in the center for the steam of the filling to escape and then, with a metal spatula place the filled hammentashen on a cookie sheet (lined with parchment paper). You can use an egg wash or not, depending on if you’re going to use a frosting or glaze on the finished Hanentashen/handpie. In the bowl of a food processor combine the flour, salt, and sugar. Pulse 2 times to combine. Add the pieces of margarine or butter and pulse to combine slowly adding the 1/4 cup of water. Pulse just until the dough comes together (adding more water if necessary). Do not over process. In a food processor fitted with the Steel Blade, process eggs with sugar, oil and juice until blended, about 5 seconds. Add baking powder and flour. Process just until mixed, using on/off pulses. Do not over process. Preheat oven to 400. Line 2 baking pan with parchment paper. 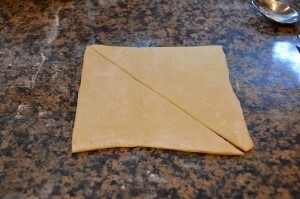 Roll the pie crust recipe into one big rectangle and then cut it into 3 or 4 long strips (depending on the size of hammentashen you want). Cut each strip into 5 or 6 squares and then cut the square on a diagonal so each square becomes 2 triangles. Place 1 teaspoon Nutella on half of the triangles and spread almost to the edge. Place a heaping teaspoon of the cherry preserves on top of Nutella. Wet the edges of the triangle with the filling with a little water, place the 2nd triangle on top and crimp the edges with a fork. Poke a hole in the center for the steam of the filling to escape and then, with a metal spatula place the filled hammentashen on a cookie sheet. Brush the egg white mixture over the top. Bake 15 to 20 minutes or golden brown. Cool on a rack then glaze with the powdered sugar mixed with the water. Makes 18 to 24 depending on the size of the triangles. In the bowl of a food processor combine the margarine, flour, sugar, cinnamon, and salt. In a sauce pan combine the mangos and peaches, sugars, cinnamon and water. Mix to combine and bring to a boil then reduce to a simmer. Cook for 3 to 5 minutes then add the flour, mix to combine and cook for 1 minute. Remove from the heat and let cool. .Repeat process for the remaining triangles. Put the hammentashen in the freezer while preparing the oil for frying or oven. In a fry pan heat about two inches of cooking oil. (To see if hot enough to cook the hammentashen, drop a quarter size piece of dough into the hot oil and if it bubbles and browns quickly, you’re good to go. With a spatula place the hammentashen into the hot oil. Cook for 1 to 2 minutes or just until the edges start to brown. Flip and cook another 1 to 2 minutes. Remove and let drain on paper towel for 2 minutes then place on a cooling rack. When cool sprinkle with powder sugar and serve. Preheat oven to 400. Before baking poke a few small holes in the top of the hammentashen to vent steam. Bake 18 to 20 minutes or until golden brown. Makes 12 to 18 depending on the size of the triangles you cut.